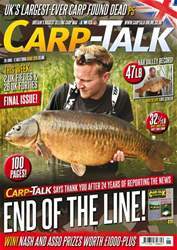 This week’s issue of Carp-Talk (issue 1063) is available to download now. We’ve got the full story of Chris Hellyar’s capture of the Gurm at 52½lb on his first session back on Fryerning Fisheries’ Main Lake. We’ve also got forties from Cottington, Emperor Lakes, Linch Hill, Willows, Acton and Leverets. 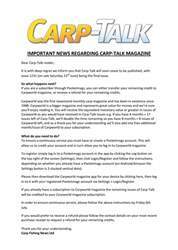 We announce the winners of this year’s Carp-Talk Awards and look back on Carpin’ On at Five Lakes. Five more venues go under the spotlight in ‘Where to Fish’, and Roy Russell has a sleepless night. 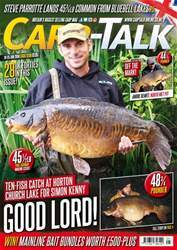 Products from Nash, Korda, Fox and CC Moore are in ‘Trade Talk’, and Steve Briggs is rewarded for his patience. The Sticky monthly winners are announced, and there is £230-plus worth of Solar products to give away.